The 2015/16 season is all over now bar the shouting (and a few FA charges) although in reality, ours was over a lot sooner than most. That’s not to write us off completely though because whilst the football and the attitude of our players have stank for most of the season, Monday night’s second half might just leave us with the faintest glimmer of hope for better days ahead again. I don’t think any of us are naïve enough to get carried away after a draw at home, particularly when it’s to a side who’ve failed to beat us at Stamford Bridge in 26 years of trying. We were far from convincing in the first half against Spurs, although to be fair, it must be hard to find a rhythm when you’re being upended every two seconds. The fact remains though, from 2-0 down our players dug deep to give us a well-timed reminder of the fight we’ve come to expect at Chelsea. From back to back titles with Jose Mourinho and the side that won a cabinet full of silverware through sheer determination and not knowing how to lose, to Ancelotti’s double winners and most definitely the Chelsea side who refused to give up in their pursuit of the Champions League until Didier had put the winning penalty away, we’ve had balls. Even last season, this same side got themselves into a winning position before taking their foot off the pedal in the second half of the season, yet still delivered the Premier League trophy. That’s the sort of fight we’ve missed throughout our car crash of a season and it’s exactly the sort of fight we’d wanted to see from our players on Monday night. All jokes aside, Chelsea were never really going to leave it to the last game of the season to hand Leicester the points although if push came to shove, I’m sure the canteen staff would’ve loved their debuts. Our players might have made it crystal clear their preference was for Leicester to win the title this season, as had everyone else in the world of football and beyond, but it was very much in our hands after Leicester’s draw against United. Hiddink’s team selection suggested he didn’t truly understand the importance of this fixture to us, or maybe he just wanted to make Ranieri sweat a bit because Hazard’s absence in the first half had almost as much impact to our detriment as his appearance had to our benefit in the second. Whilst Spurs gave a public demonstration of how not to play with backbone, we ran the gauntlet of studs (and even snot in Costa’s case), to cancel out their 2 goal cushion, with a goal from Cahill and then a sublime Eden Hazard equaliser. To suggest Spurs lost their heads in this game would be an understatement in the extreme. I’ve seen headlines comparing them to drunks in that second half although that might depend on what sort of watering hole you frequent. I’m not sure I’d fancy drinking anywhere where 69 year old men are shoved over in brawls sparked by sore losers, particularly when the local rag interprets it as an accidental ‘tumble’ long before any call to InjuryLawyers4U can happen. Of course, the 9 yellow cards, which were lenient by the way because I counted at least 3 for Dier and the same again for Walker alone, were obviously Chelsea’s fault, as was the lack of control by the Spurs players and manager alike. The post-mortem has ultimately seen the whole debacle blamed on Hazard and Cesc for publicly wanting Leicester to win the league and Cesc’s apparent ‘wind-up’ behaviour all game. I think it’s a fair bet I’d be pretty wound up if someone stood on my hand without consequences although we’re unlikely to read that account of the proceedings. What we have read are accusations of Costa ‘biting’ Vertonghen in the post-match free-for-all, followed by quick retractions when someone with half a brain susses the Spurs player looks more like he’s trying to see whether Costa has a flip-top head at the time. 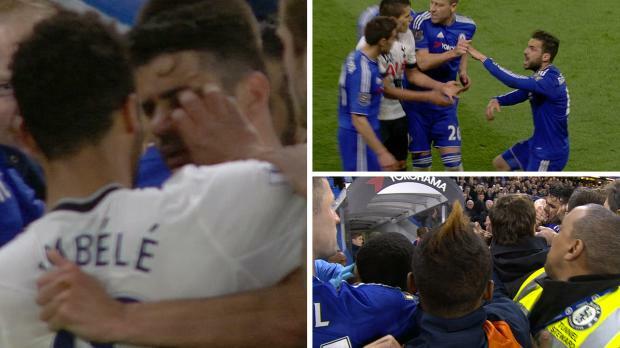 This is the same Diego Costa who is of course, trying to assault anyone within ten feet of him, although how he could still see straight after Dembele had tried to steal his eyeballs at half-time, I’m not quite sure. Suffice to say, we’d kept our heads on the pitch whilst Spurs were totally losing theirs, just to make certain the title was mathematically Leicester City’s but gave as good as we got at the finish. Harry Kane thought we celebrated like we’d won a cup although I wouldn’t have thought he’s familiar enough with those sorts of celebrations to recognise them anyway. The ‘celebrations’ of course will have been much more about us making sure we sustain an unbeaten record against Spurs at Stamford Bridge, that is embarrassingly long in this day and age of the game. Well, that and nailing their coffin marked ‘distant hopes of a title challenge’ firmly shut anyway. And we did that because whether it came down to professional rivalry or, as a direct result of bruises sustained on the night, we had a bit of fire in our bellies again – and in reigniting that, Spurs might have inadvertently done us a favour. Neither Jose nor Hiddink could seemingly motivate our players this season and players like Fabregas, Hazard and Costa have been written off and sold on several times over by supporters and critics alike throughout the season. Monday night suggests this might have been hasty. It’s clear there’s still a major amount of restructuring required at Chelsea but somehow the foundations don’t look quite as shaky now.